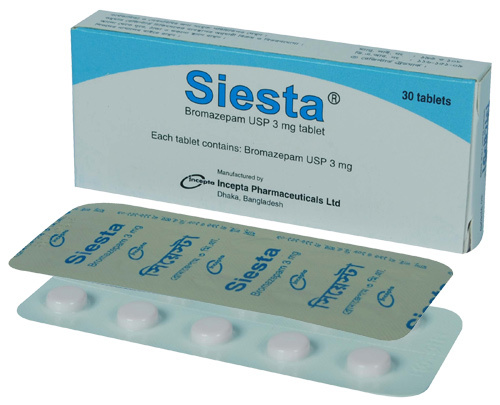 Siesta: Each tablet contains Bromazepam USP 3 mg.
Siesta is a pyridylbenzodiazepine compound with anxiolytic properties. In low dosage, it diminishes anxiety, tension and nervousness. In high dosage, the sedative and muscle-relaxant properties appear. * Emotional disturbances: Anxiety and tension states, as adjuvant therapy for anxiety in depressed patients, nervous tension, restlessness, and anxiety- and tension- related insomnia. As an adjuvant to treatment of underlying disease responsible for functional or psychosomatic impairments of various organs caused by anxiety and tension. * Cardiovascular and respiratory systems: Pseudoangina pectoris, precordial anxiety, tachycardia, emotiogenic hypertension, dyspnea, and hyperventilation. * Gastrointestinal tract: Irritable bowel syndrome, ulcerative colitis, epigastric pain, spasm, meteorism, and diarrhoea. * Urogenital tract: Irritable bladder, urinary frequency and dysmenorrhea. * Other psychosomatic disturbances: Psychogenic headache, psychogenic dermatoses. Siesta is suitable for treatment of anxiety and tension states due to chronic organic disease and as an adjuvant to psychotherapy in psychoneurosis. Adults: The optimum dosage and frequency of administration of Bromazepam is based on the individual patient, the severity of symptoms and previous psychotropic drug history. Average dose for outpatient therapy: 1.5 - 3 mg 3 times daily. Severe cases, especially in hospitals: 6 - 12 mg 2 - 3 times daily. Treatment of outpatients should begin with low doses, gradually increasing to the optimum level. In general, the total duration of treatment should not exceed 8-12 weeks including a tapering-off period. In certain cases, treatment may need to be continued beyond the maximum recommended duration but only after a careful reassessment of the patient's condition and indications. Elderly patients: Doses should not exceed half those normally recommended. Children: Bromazepam is not for paediatric use. Common side effects include drowsiness, sedation, unsteadiness and ataxia. These are dose-related and may persist into the following day, even after a single dose. Other side effects are rare and include headache, vertigo, hypotension, gastrointestinal upsets, skin rashes, visual disturbances and urinary retention. In patients with chronic pulmonary insufficiency, and in patients with chronic renal or hepatic disease, dosage may need to be reduced. Bromazepam should not be used alone to treat depression or anxiety associated with depression. Bromazepam should be used with extreme caution in patients with a history of alcohol or drug abuse. Pregnancy: The safety of Bromazepam in pregnant women has not been established. Bromazepam should not be used during pregnancy, especially during the first and last trimesters, unless there are compelling reasons. Lactation: Benzodiazepines have been detected in breast milk. If possible, the use of Bromazepam should be avoided during lactation.